Ellen Hayashi, 13, began violin at the age of six. Her previous teachers include Sachiko Endo and Deborah Moench. 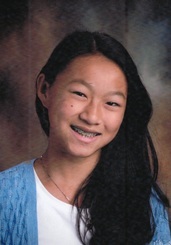 Ellen currently studies with Eugene Watanabe and is a student in The Gifted Music School Conservatory. Previously, Ellen was a member of the Rocky Mountain Strings, with whom she performed throughout Utah and in Russia, Estonia and Latvia in 2015. Ellen has performed honors recitals at the Peaks to Plains and Intermountain Suzuki String Institutes, and was a selected participant in the Suzuki Youth Orchestra of the Americas in 2014. Ellen also won the youth division of the Oquirrh Mountain Symphony Concerto Competition and soloed with them in 2014. In both 2015 and 2016, Ellen won her divisions of the UMTA Concerto Competition. In 2016, she also was selected to perform both as a soloist and in an ensemble in the Utah Symphony Youth Guild Recital, as well as in masterclasses with Arnold Steinhardt and Stefan Jackiw. Ellen is in 7th grade at the American International School of Utah, where she serves as concertmaster of the symphony. When not playing violin, she likes hanging out with friends, riding horses, doing art, and snuggling with her dog Treble. Ellen is the daughter of Kristen Keefe and Herbert Hayashi and lives in Salt Lake City.